Kit preview of Revell Perry Rhodan Marco Polo Preview. 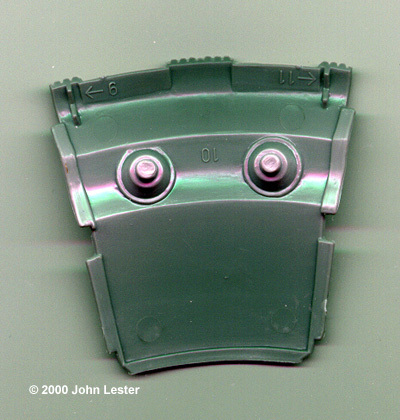 Parts: 78 injection molded styrene. Instructions: 7 pages, 12 steps, with well detailed paint and decal guide. Decals: HUGE waterslide sheet with markings for one ship. Molding Quality: 7 - not great, but not bad. Detail: 7 - fairly crisp, though some paised lines do not meet across part halves. MSRP: $15 USD, available from hobby shops with access to Revell DE kits. Overall Rating: 8 - It's just too cool! ^ More decals than parts - and that's saying something! ^ Hull center segments, 16 total. Image: Center ring, more segments and legs. ... but are quite familiar to Germans (and other European readers, to a lesser extent). The Perry Rhodan pulp series has been called the Star Trek® of Germany - but you can read all about that here. 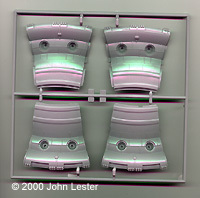 Revell DE (the German-based component of Revell-Monogram) released three kits depicting Perry Rhodan vehicles in early 2000, with another slated for later this year. 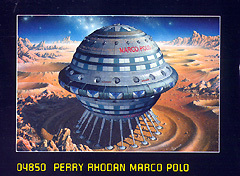 The Marco Polo space battleship is the second in the series. It comes in Revell's standard flimsy box, with the standard glossy artwork, and standard quality pieces. What's not standard Revell is the decals - but more on that in a minute. Like the Space Jet Glador, the parts are molded in Poland. They're crisp and defect free, with only a tiny amount of flash. There are an awful lot of parts on seven sprues, safely ensconsed in two plastic bags to protect from scratching. 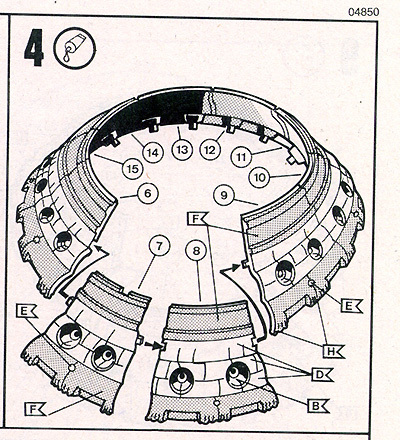 The parts are multiple copies of eight basic types: legs, guns, top and bottom caps, center ring and hull segments. A very nice touch is molded to the backs of certain pieces - arrows pointing to which identical-looking part fits where. The instructions are vintage Revell, right down to the flimsy newsprint they're printed on. After two pages of various warnings in every language known to man, one gets well drawn diagrams in 12 steps, followed by three view drawings with decal placement instructions. It's all very clear and logical. An absolutely huge decal sheet completes the package. 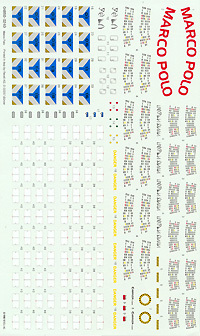 Printed in Italy, these are not the same type seen in other Revell kits, especially aircraft. For one thing, they're glossy and in register. They also are not made up of those annoying dots Monogram is so fond of. Markings are provided for one ship, and include windows, shuttle bay doors, and white squares that look a lot like Starfleet®-issue escape pod covers. Though there are a lot of parts, there's not much to building the kit - it's deceptively easy, in fact. 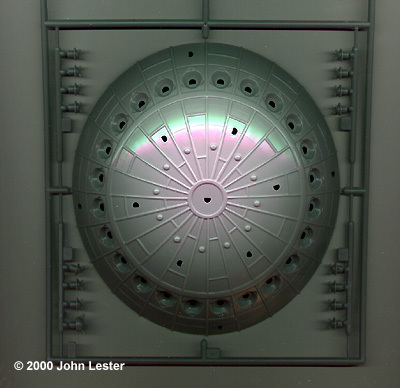 Like ERTL's Death Star kit, the spherical hull is broken up into segments that slot together to form the middle of the sphere. 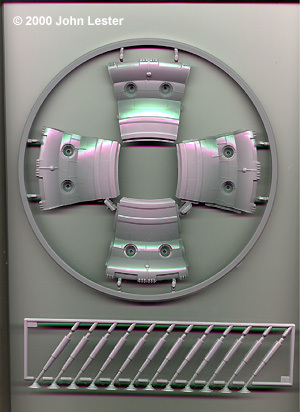 Eight segments make up the top middle ring, with eight more going below, separated by a central ring. These assemblies are capped with two ... well, caps, one of which sprouts a forest of landing legs. Like the ERTL Death Star, alas, fit of all these segments is not all that great (at the time of writing, I have one half of the kit built). Aligning the pieces and keeping them that way as the glue dries is tricky, but not as tricky as filling the gaps will be. Allow the center sections to dry thoroughly before attempting top put the caps on. You'll also want to leave the guns and legs off until after you paint the hull, to simplify masking and painting. It's ceratinly a different looking kit. Despite the fit problems, I'm excited to finish this model ... if I can come up with an appropriately cool paint scheme (perhaps camoflaging it as a moonlet?). Kudos to Revell for releasing it, and many thanks to Terry Miesle for picking me up a copy whilst in London. This page copyright © 2000 Starship Modeler. Last updated on 9 May 2000.